4-piece including caller. Play 2½ hours over 3 hour period. Recorded music in breaks. Blackthorn is a band of talented enthusiasts, and just the thing if you are looking for lively, melodic Celtic tunes and a good singalong. All the band members are multi-instrumentalists, and provide a varied and traditional feel to the music. 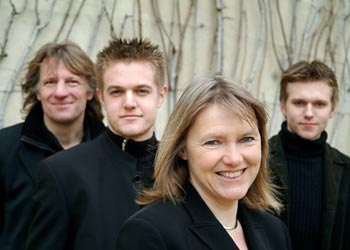 Blackthorn performs at functions, folk clubs, weddings and parties all around Southern England, and sometimes further afield. Fergus McClelland (vocals, bouzouki, fiddle, mandolin, guitar, melodeon, banjo) and Mannie McClelland (concertina, guitar, mandolin, vocals) were founder members in 1995, Philippe Barnes (flute, whistle, guitar, bodhran) joined in 2001, Alex Percy (guitar, fiddle) in 2003 and the line-up is completed by occasional members Bing Lyle, Nicola McClelland, Sarah McClelland and Nick Pynn. The band has a special emphasis on songs from Ireland but also has a large repertoire of traditional tunes from England, Scotland and Wales too – jigs, reels, hornpipes, polkas, waltzes, planxties and airs. Sing along with well known songs like the Wild Rover, and the Leaving of Liverpool, or get up and dance! Our quoted price is for the four-piece band, with one of the band members also acting as caller if required, but for an additional charge a separate caller can also be included. If desired, the band can also be strengthened with more instrumentalists too. The band provides its own full PA system and will normally play for two-and-a-half hours over a three hour period. During breaks, the band can also play CDs through their PA system if requested. Blackthorn are based in Sussex. See Pricing for details of travel costs, etc. "I just wanted to thank you so much for such a fabulous evening ... You exceeded every expectation and managed to pack so much life and enjoyment into the evening despite the late start. I hadn't imagined that so many people would want to dance and you coped brilliantly - there were family and friends dancing that have never been seen anywhere near a dance floor before. All the messages from our guests have said how much they enjoyed the music and dancing. We had a number of folk fiddlers and ceilidh veterans in the crowd so consider that praise indeed. Once again many thanks and hope to come across you somewhere in the future." "...we were delighted with the atmosphere created and will consider re-booking again."